Dancing Bear is the kind of place you can kick back, relax and enjoy. This 3 bedroom, 2 bath cabin is spacious and has been furnished with beauty and comfort in mind. The leather sofa, love seat and rocker recliner makes for a relaxing place to converse with friends, enjoy a good movie on the 50" flat screen, or play a game on the Wii. The stone gas fireplace provides warmth on chilly mountain evenings and creates a cozy atmosphere. The king master with private bath and 37" flat screen is as comfortable as it is beautiful. The fully equipped kitchen with all stainless steel appliances allows for some great meals which you can enjoy in the dining area for 6 or if weather permits, on the covered back porch overlooking the woods. The back porch is also a great place to watch for the abundance of white tail deer that occupy the area. Dancing Bear is located in the Coosawattee River Resort, a popular, gated community located only 10 minutes from downtown Ellijay and as our guest you are privy to enjoy the various amenities that the resort offers,such as: Rec Center with Olympic indoor heated pool, 2 outdoor pools, exercise room, arcade, tennis, basketball, putt putt golf as well as several areas that you are welcome to fish. All of this comes at no additional cost to our guests. Did we mention that Dancing Bear is also pet friendly? Well it is, and we provide a dog bed and food/water bowls so there is no time better than right now to call and reserve Dancing Bear for your next getaway! Its was located in a very nice neighborhood we felt safe plus we saw so much deer. All the appliances were modern. Floors were spotless. Although the Dancing Bear was dancing bare; we did all our dancing fully clothed! Our "Girls' Week" (myself, one of my daughters, three of my granddaughters) went well here at Dancing Bear. The two key words for the accommodations: clean and comfortable. We felt completely at home, with no sense of "other people's cooties." The couches and beds were fresh and good quality for comfort. Every one of us slept soundly and well. There were plenty of fresh bath and kitchen linens; the kitchen was stocked with everything we needed. The water pressure in the bathrooms was adequate - certainly better than in our own home. The roads within the resort were confusing, of course, but we enjoyed the rambling travel and the beautiful scenery; and we especially enjoyed the large indoor heated pool at the Rec Center. The weather was so hot that we didn't get to enjoy the deck and porch at the house as I anticipated, so we stayed inside most of the time we were "home." We were somewhat disappointed that there was not a hot tub but we had a nice time without it. Our goal was to enjoy some time together and strengthen bonds before the three granddaughters go away to college. Mission accomplished. Beautiful cabin in nice quiet area with only local recipient traffic other than all the Deer  ★ ★ ★ ★ ★ If you're looking for a real nice place to stay while in Ellijay I highly recommend Dancing Bear Cabin, it instantly makes you feel at home open and very roomy with an awesome back deck over looking the trees and forested hillside and all the resident Deer 歷 oh did I forget to mention all the Deer 12+ a day can be seen around the Cabin area. Just book it, leave all your troubles behind and enjoy!!! The cabin was everything described on the site and more! Extremely comfortable with all of the modern amenities of home with a rustic, cabin feel! My family and I thoroughly enjoyed ourselves and can't wait to come back to stay again sometime! 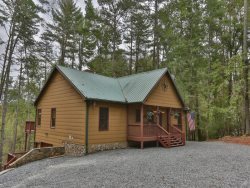 Dancing Bear is a must stay cabin in Ellijay! Booking the Dancing Bear cabin was easy and efficient on your website and we especially appreciate the staffs help with finding us a cabin for the week of Thanksgiving. The cabin itself was very nice. The beds were comfortable, the kitchen well stocked with utensils, dishes, etc, the linens were in brand new condition, the sofa was great and fit our family of 5 easily and comfortably. Overall it was a great experience. We would definitely book again through Mountain Oasis Cabin Rentals.